LOUISVILLE, KY (WAVE) – In the 14 years since it started, more than 2,600 people have had their college tuition paid for through their participation in the Metropolitan College Program. Speaker Pro Tem Larry Clark has filled House Bill 405 to increase the number of students whose tuition and costs may be taken in to account when calculating the amount of tax credit available under the Metropolitan College program. That program employs college students at UPS and the state picks up half of their tuition. The company takes the other half. 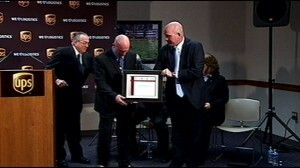 Last year, UPS expanded that program, adding in the “Ambassadors” Initiative and other well-known area employers like Ford, Papa Johns, Norton Healthcare and others. It tries to guide the education path of metropolitan college students, with those high-demand careers in mind. Norton and Ford just hired Metropolitan College Ambassadors and several others are in line for positions at other Louisville companies.